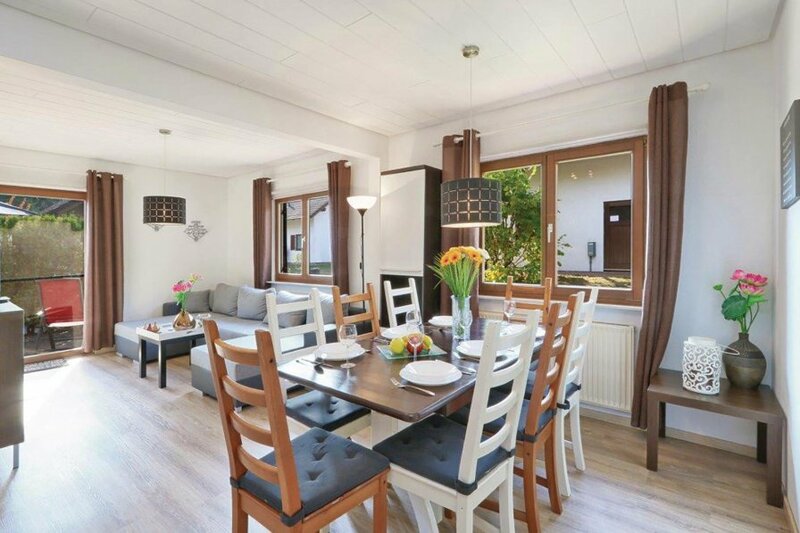 This 5 bedroom house is located in is located in Kirchheim and sleeps 9 people. It has WiFi, barbeque facilities and parking nearby. The house is near golf. This beautiful house is made from wood and brick and was originally built in 1997 and refurbished in 2018. The agent has rated it as a four star property so it is a well-equipped house with above average furnishings. It is also great value for money. The houseIt is located in Kirchheim, only 15km from Bad Hersfeld. It is set in a very convenient location, just 600 metres away from a lake. There's also a restaurant only 500 metres away. The house has wireless internet available for an extra charge. You can also park on-site at no extra charge. The house is well equipped: it has a refrigerator, microwave, washing machine and dishwasher. It also has a barbecue and some garden furniture outside.